Eventually an older house should require roof replacement. Contractors may give us some estimates, but it is important to make sure that we are choosing the right kind of roofs. There are several components of roof that we should consider. Shingles are one of the primary components of roof and it should allow us to estimate the actual amount of roof replacement. There are different types of shingles that we need to consider. The most popular designs are dimensional and architectural. Good shingles should create more interest and we should look closer to the matching type of tile or slate. We should consider various color options and choices. We should consider estimates that can determine the manufacturer’s warranty for specific type of roof. Flashing may also need to be included in the estimates if our house has walls, dormers and chimneys on the roof. Flashers are important to prevent moisture from seeping under and behind shingles. It also means that water damage can be prevented during heavy rainy season. Flashing is usually consisted of galvanized steel or thin sheets of aluminum. Professional roofers could use sheet metal to fashion their own flashers. Flashing us usually installed over joints, especially in the wall and roof construction. Edges, decks, porches, skylights, pipes, windows, dormers, chimneys and valleys are possible areas where flashers are usually installed. Eventually flashing comes loose and deteriorates. If not repaired or replaced soon, severe damages could be inflicted on the home. Unnecessary damages should be avoided y making sure that flashing is properly installed. Underlayment is another item that must be included when we plan to replace the roof. In general, underlayment is a protective layer that is placed between the shingles, plywood and roof deck. 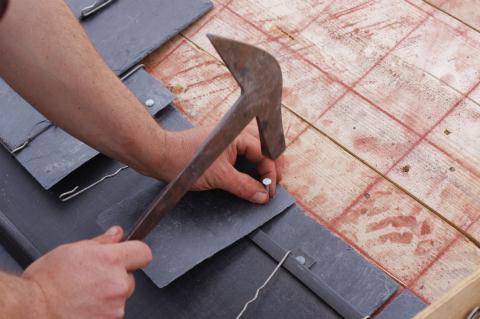 Felt paper is usually used as the first layer of waterproofing in our roofing structure. Underlayment may also need to be strengthened with fiberglass and this would improve resistance against tearing. We should look for new underlayment methods in the market that can be implemented in our house. As an example, we may choose new synthetic underlayment material to improve longevity and ease of installation. We may also choose green and underlayment products if we are quite concerned about this topic. It is important to choose underlayment products from the same manufacturers, so it would work with our current roofing structure. When choosing roofing products, we may need to consult with the contractor to make sure that we are choosing the right model, based on the current climate and type of our house. Drip edge is another component that we should look for and include in the costs list. Again, we should look for recommendations from the contractor, so they are comfortable with working with the type of drip edges that they want. In essence, drip edge is a metal strip that’s often applied along rakes, eaves and gutter lines. A strong and durable roof would make sure that our house will be properly secured against any kind of weather exposure.